heinnews’s David Hein is at the 2012 FIBA U17 World Championship working for the venue’s website. 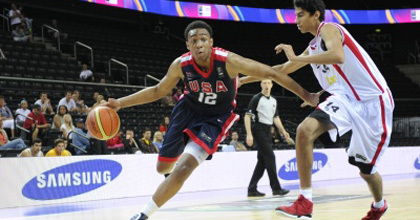 He took the chance to talk with U.S. superstar Jabari Parker – the number one ranked player in his age class. They discussed the Americans’ 3-0 start to the championship and sharing the ball with fellow stars; improving his game through the international experience; dealing with the pressures and expectations of being a young top talent; being a member of the Ladder-Day Saints; and having an NBA player as a father. Portions of the interview appeared on the website, while this is the full length interview. heinnews: You have played three games and have three victories, how would you evaluate the beginning of the championship so far? Parker: It’s been good. They’re giving us a little bit of a preview of what to expect in the championship and just preparing us for the playoffs (knock-out stage). That’s where we want to be, where we want to get to. And hopefully we’ll pick up things from there. heinnews: The USA team is full of superstars, how do you manage to share the ball among all of you? Parker: We just put our egos aside. We just play amongst each other and try to involve all of our teammates, just always being positive. heinnews: You are ranked number one in the USA in your age group. How do you think coming here can improve you as a player? Parker: Every opportunity I get to play against the best competition, that just betters my game. And one day, if I don’t get a chance to play in the NBA, maybe I can get some looks at playing overseas. heinnews: What’s been the biggest thing you’ve learned playing international ball? Parker: It just prepares me for other things. Maybe one day I would get to play for the USA team in the Olympics. It helps me become familiar with playing under different rules and different styles of play. heinnews: Has anything surprised you culturally during your trips with USA Basketball? Parker: Not really. You just have to humble yourself and be adjusted to what they offer. Lithuania is a very beautiful place, very clean. It’s different from anywhere in the States. heinnews: You are the number one player in the States in your age group, how do you manage to stay so humble? Parker: I don’t let it get to my head. I play basketball for the fun of it. I don’t do it for any hype, any acknowledgement or accolades. I just do it because I love it and because I’m a competitor. I just love winning. heinnews: You have a lot pressure and expectations with being such a highly regarded player. How are you dealing with that? Parker: At first it got to me. But now I’m just learning how to let it go through my ears and not pay attention to it. I just need to keep going out there and get better and never find myself getting complacent. And just have fun. I’m not going to be able to play basketball for as long as it counts. So I just have to have fun with it. heinnews: Is not winning the gold a failure for Team USA? Parker: Yeah, it’s a failure. We come out here as the best team. We can’t come home without winning gold or they will ask us a lot of questions. So to prevent all that from happening we just have to go out and win. heinnews: Being from the Ladder-Day Saints, you have the option of starting a mission or going to college and play basketball. Have you made a decision on that yet? Parker: I haven’t made a decision yet. As the years go by I just want to make my example as a person. I just want to do what’s best for me. heinnews: When people ask you about LDS, what do you tell them? Parker: I’m here on this Earth not too long and I’m just here to leave my mark. I’m very religious and I’m here to spread the gospel and get people to know God better because that’s what helps me. It would be selfish if I didn’t give them the good word and that helps me out. heinnews: Your father was an NBA player, how does he help you in your career? Parker: Not a lot of people have the opportunity to have a two-parent home. And I think I’m lucky. I think my dad has helped me in different ways that I don’t even appreciate yet. But now as I start getting older I’m just starting to be more thankful. He has so much knowledge of the game. just his example and his activeness in the community is what I look up to. heinnews: Where do you see your game right now, what do you need to work on? Parker: My problem has been getting healthy. I’ve been getting a lot of bumps and bruises. I just need to prevent that and be better mentally.